Find Video for xBox with CoolUtils tool! You are here: CoolUtils > Total Image Slicer > Find Video for xBox with CoolUtils tool! Cutting an image can be a challenge when you do it manually in an image editing program. But it may be simple and pleasant if you use professional Total Image Slicer. It is designed specially for cutting images into parts. Imagine you may cut your images in an automatic way and always get great results. Total Image Slicer cuts images to any number of equal parts. On the right you see an example of the sliced image (3x3). 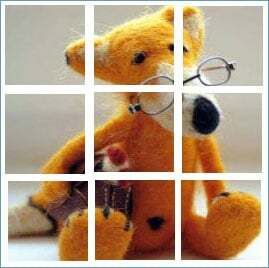 To cut an image into 9 equal pieces you should launch Total Image Slicer and select 3 in the columns and rows fields. Note that you may cut any image by any number of pieces, just type in the desired number. Tip! Total Image Slicer can slice images to the pieces of any size you want. Select the first option (disabled at the screen shot) to set the required size. After the image is processed you get 9 images. By default all of them are placed into one folder. Every file gets a name plus its number for your convenience. Remember that Total Image Slicer can merge images as well. Get your copy now for the fastes and most convenient cutting and merging images!